I never get tired of Mexican food. There are so many unique dishes with different flavor profiles making the options endless. 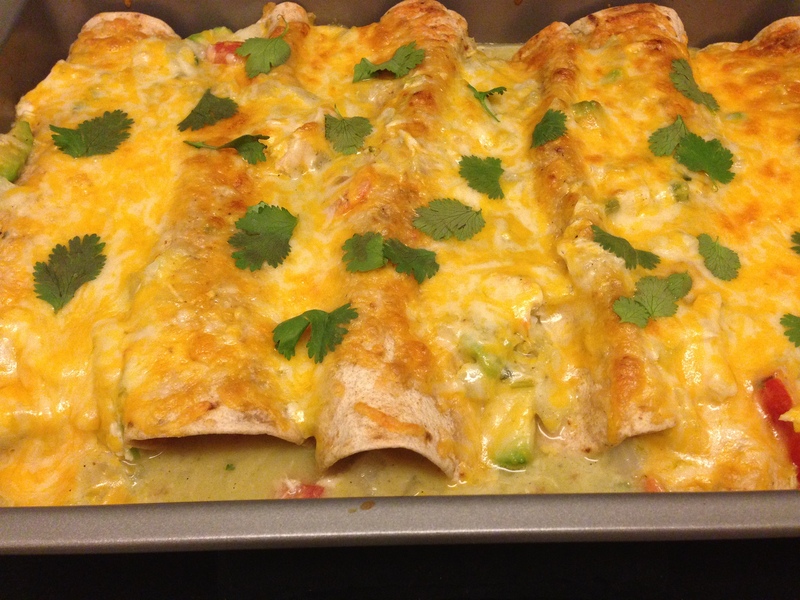 If you told me that I could make an awesome Mexican dinner in less than 30 minutes, I would say ‘sign me up.’ Cooking Light told me that with their Chicken Verde Enchiladas, which are made in under 30 minutes, and I did not hesitate one second to rip out the recipe out and buy the ingredients. First, place oven rack in lower third of oven, and preheat broiler to high. Then, combine first 8 ingredients in a medium saucepan, stirring with a whisk. Bring to a boil; reduce heat, and simmer 4 minutes. Stir in chicken; cook 1 minute or until heated. Remove from heat. Stir in tomato, sour cream, and avocado. Next, stack the tortillas and wrap in damp paper towels. Microwave at HIGH for 45 seconds. Spoon 1 cup chicken mixture into an 11 x 7-inch glass or ceramic baking dish. Spoon 1/3 cup chicken mixture in center of each tortilla; roll up. Arrange tortillas, seam sides down, in baking dish. Top with cheese. Broil 3 minutes or until cheese melts. For the finishing touch, sprinkle with cilantro leaves. I could not even let these cool down before digging in. I was hooked. I loved the fresh avocado within the enchiladas–it brought down the spice of the jalapeno and gave the dish a cooling element. The crispy broiled cheese added a gooey as well as a crunch component. Hands down, I would make this recipe again–I’m so excited that I have leftovers for the week. Test it out–I’d love to hear your thoughts/feedback. But until next time, keep eating! I took a trip to Santa Barbara to visit my sister and had an absolutely amazing time. We did everything from walking to wining and dining–and boy did we eat. I must say I haven’t had better Mexican food anywhere else. Everything was so fresh and delicious. One of my favorite places was Carlitos, this adorable, authentic Mexican restaurant in the heart of Santa Barbara. By dinner time we were both starving–having walked around all day we certainly worked up an appetite–and were so excited when they brought us fresh homemade tortilla chips and salsa. Wow is all I have to say. We gorged ourselves on chips and couldn’t wait for our next course to come. Up next was their shrimp empanadas. My family and I have this rule that when we go out to eat we order something we wouldn’t make ourselves. And my sister and I carried on that tradition. 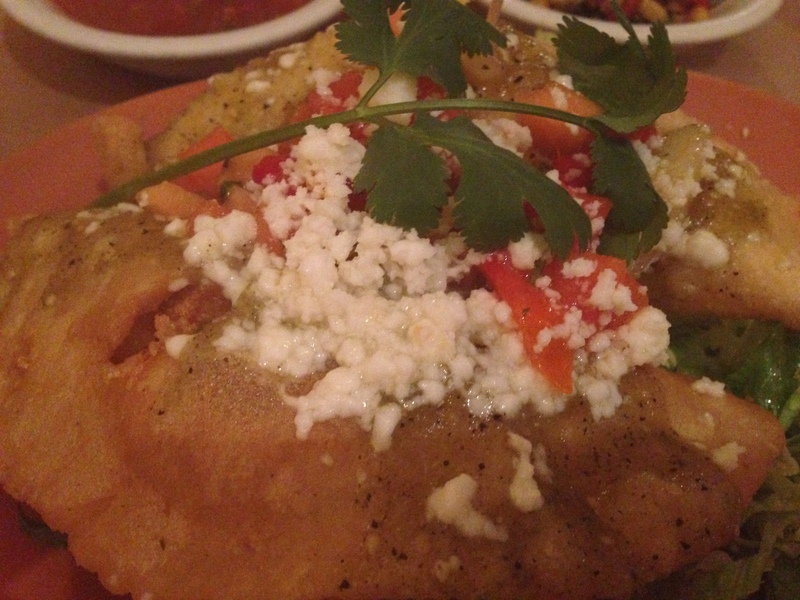 These empanadas were packed with shrimp, asadero cheese, papaya salsa, and a chipotle cream. And not to mention, they were the perfect amount of crispy. I was in a food heaven. If that course didn’t win my heart, my main entree did: their sizzling fajitas platter. The biggest platter you’ve ever seen. I can usually finish my plate but this particular time I have to admit I didn’t even make it through half. I got the chicken and steak combo which came with homemade corn tortillas, guacamole, salsa, sour cream, rice, and black beans. A feast some would say. The chicken ans steak were cooked perfectly and combined with fresh guacamole, sour cream, and salsa, all rolled together in a tortilla was dynamite. If I ever visit Santa Barbara again (which I definitely plan on doing), I will be back to Carlitos, and ready to try another fabulous meal. But until next time, keep eating!